13 January 2009, at 6:49a.m. UK - To ring in the new year, Bernard Matthews Farms is launching a £200,000 on-pack promotion giving 40 consumers the opportunity to win £5,000 towards their year’s grocery shopping. 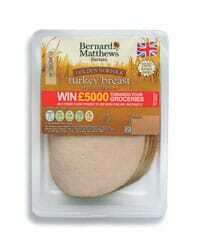 In store from the second week of January and running for one month, the ‘Win £5,000 Towards Your Groceries’ promotion is running on 16 stock-keeping units (SKUs) and approximately 3.6 million packs of Bernard Matthews Farms’ recently relaunched Deli lines including its top selling Wafer Thin Turkey Ham and products from the new Golden Norfolk Turkey cooked meats range. Each ‘Win £5,000 Towards Your Groceries’ promotional pack carries a unique code that consumers enter into a special Bernard Matthews micro-site, which tells them instantly whether or not they have won. Winners simply send in the pack label with winning code to claim their £5,000 prize, which will cover a year’s groceries based on an average weekly spend of £100. Continuing the successful Little Books of Ideas series and supporting the theme of the promotion, consumers will now be able to download a Little Book of Healthy Living giving hints and tips on eating healthily on a budget. All the turkey in the Bernard Matthews Farms cooked meats portfolio is now 100 per cent British turkey meat from turkeys reared on the company’s own farms across Norfolk, Suffolk and Lincolnshire. The products are all low in saturated fats, with no artificial colours or flavours and, wherever possible, no preservatives.